Rappahannock County, Virginia Horse Directory - O Horse! Stalls available for Fall 2010. Center aisle barn, wash rack, cross ties, tack room, 2 arenas - one dressage, one jumping, and trails. Lessons for beginners or experienced riders. Natural horsemanship training and exercise riding available. English or western. Experience showing hunters, dressage, Extreme Cowboy racing, and ACTHA. Professional and experienced blacksmith relocating from Maryland to the northern Virginia area. Lifelong horseman and trainer, my goal is to help your horse reach their true potential through quality shoeing at affordable prices. I specialize in corrective shoeing and have extensive experience with eventers, hunter/jumpers, dressage horses, and racehorses. Experienced in repairing quarter cracks as well as glue-ons. Always dependable and on time. Hand floating non-sedated horses for over 35 years. Virginia registered and I.A.E.D. certified. Serving central and northern Virginia and central Maryland. Offering lectures to horses organizations and pony clubs. 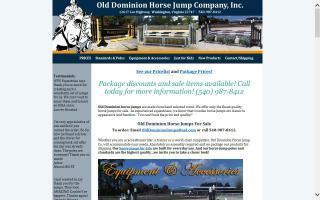 Old Dominion Jumps & Standards, L.L.C. Wood horse jumps from Virginia and horse show jumps or equine obstacles for hunter and jumper training: nationwide delivery available. East Coast provider of wood arena obstacles for sport horses, hunters, and jumpers with nationwide delivery. A Virginia realtor with Virginia horse farms for sale. A premier riding facility in the scenic foothills of the Blue Ridge Mountains. Located in Rappahannock County within hacking distance of the Thornton Hill Hounds. Turkey Hill Stables welcomes enthusiastic amateurs up to the advanced rider, catering to multiple disciplines for both horse and rider. Amenities include: full board, field board, indoor and outdoor arenas, cross country trails, clinics, lessons, training, sales, layovers, layups, overnights, and local event sponsorship. We are located an hour or less from eight of Virginia's finest fox hunts! We breed and sell affectionate, well-mannered miniature donkeys in a variety of colors at Tulip Hill Farm, Castleton Virginia. Our herd sire, Dillard's Little Casper, throws color and great conformation. Meadowbrook offers full care stall and pasture board, basic pasture board, and training board. We have an exceptional riding program, tailored to fit beginning students as well as the most advanced riders. Students may ride English or western. Meadowbrook Farm is more than a century old, with 200+ acres in a park-like setting, breathtaking views, well maintained pastures, a large outdoor riding ring, and a caregiver on site 24/7. We are located at 18 Meadowbrook Lne,in Huntly Virginia. Conveniently located on Rte 522, between Flint Hill and Front Royal, we are an easy commute from Warrenton, Sperryville, and Luray as well. Board plans range from $275 for basic field board to $425 for full care stall board, and $500 for premium stall board (Prices as of Aug 2010). Visit our web site or call for more information.